We had another successful fundraiser in Manila last November 14, 2009. 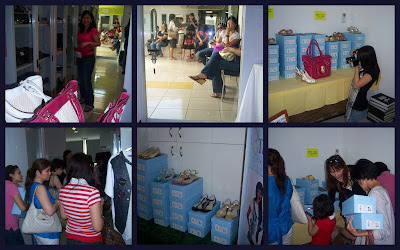 The one-day Rafe sale earned Php294,000 in bag and shoe sales! My gosh, I have never seen so many women go "crazy" over Rafe bags and shoes! We are so blessed that Rafe has helped our foundation so much from his t-shirt design to his bags/shoes. A great blessing as well are my 2 high school classmates/friends, Joy Magalona-Barreiro and Anne Ordonez-del Rosario, who organized this entire event. Joy and Jeff Barreiro as well had a "perfect" office as venue for the sale. Their staff of five gave their whole Saturday to help in the sale! Leny Ojano-Yusay also volunteered her day to help in the sale! Thanks to Jackie Millonado as well for being our "official" photographer! And of course, THANKS YOU TO ALL who came to the sale -- you were responsible for a successful fundraiser! All the proceeds of the sale will be go to Typhoon Ondoy victims and a second Rafe Totengco College Scholarship Grant to be awarded to an SFAS graduate in March 2010. - written by Micmic Golez, Executive Director of Tapulanga Foundation, Inc.
** To view photos of the sale, please click this link: rafe sale for tapulanga foundation and ondoy victims. Please join us for a Photo Exhibit to benefit Typhoon Ondoy Victims. A photo exhibit by professional photographers and hobbyists, from Bacolod, Manila, and abroad. Featured contributors will be Anne Acaso, Dino Cajilli, Ricky Villabona, Timothy Valderrama, Rommel Sancho, Imelda Tinsay, Jomie Garucho, Paolo Lindaya, Lee Meily, Paolo Braza, Val Ramos, Johanna Campos, Jay Abello and many more. The photographs will be available for sale. Proceeds will benefit the victims of Typhoon Ondoy as they continue to rebuild their lives from this tragedy. Exhibit will run for 2 weeks at KGB! For further info or to RSVP, please call 920-9514232 or 917-3065577.